This Monday's harvest report is very brief. 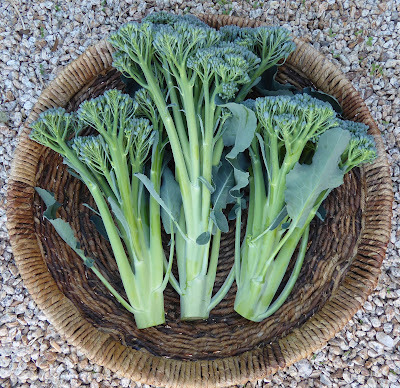 Last Monday I harvested only what absolutely had to be harvested because it wouldn't keep in the garden until today and that was 3 heads of broccolini from the new plants. Early Tuesday morning Dave and I set off for Santa Catalina Island to backpack the Trans-Catalina Trail and we didn't get back home until Sunday afternoon. The Island was beautiful but the already challenging trail was made even more so by record breaking heat. But we met the challenge and finished our planned 45 mile hike in 4 days. One good thing about the hot weather was that the skies were clear and the views long. 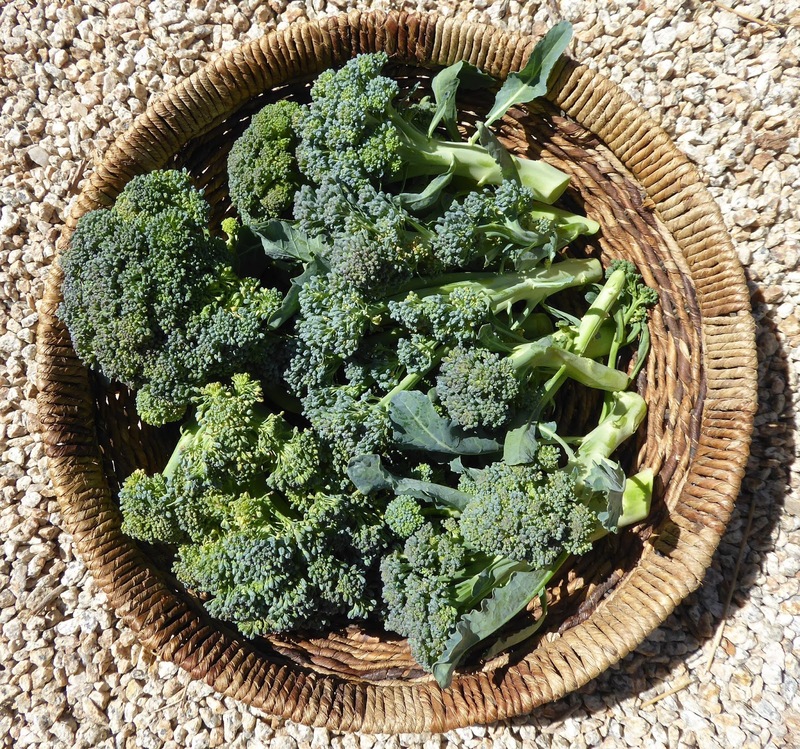 The broccolini kept very well for the week and was still sweet and delicious Sunday evening. The tomatoes that I harvested the Sunday before and showed last Monday also kept really well. 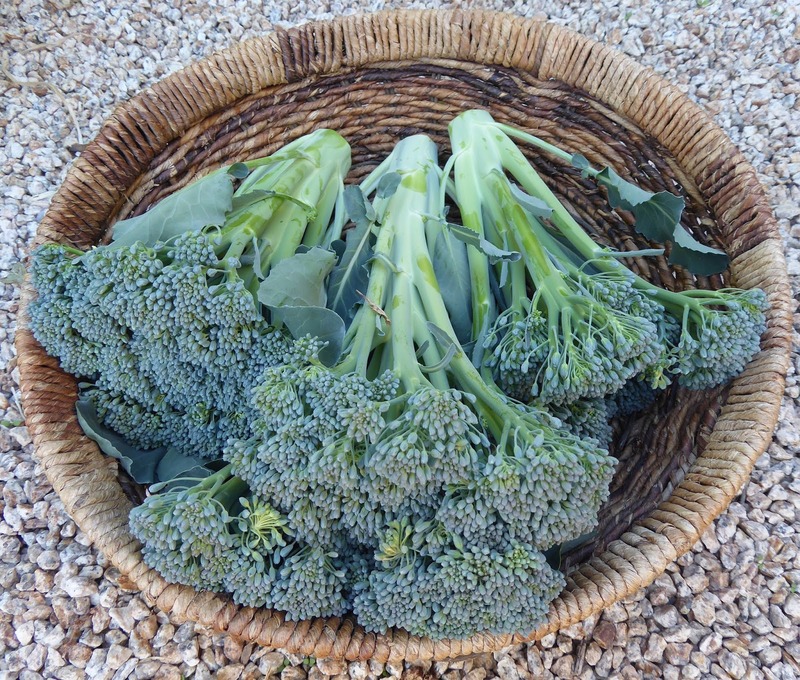 Fresh veggies for dinner was a welcome treat after the dehydrated meals that we had on the trail. Those were good because many of them featured veggies from the garden, but nothing beats fresh. 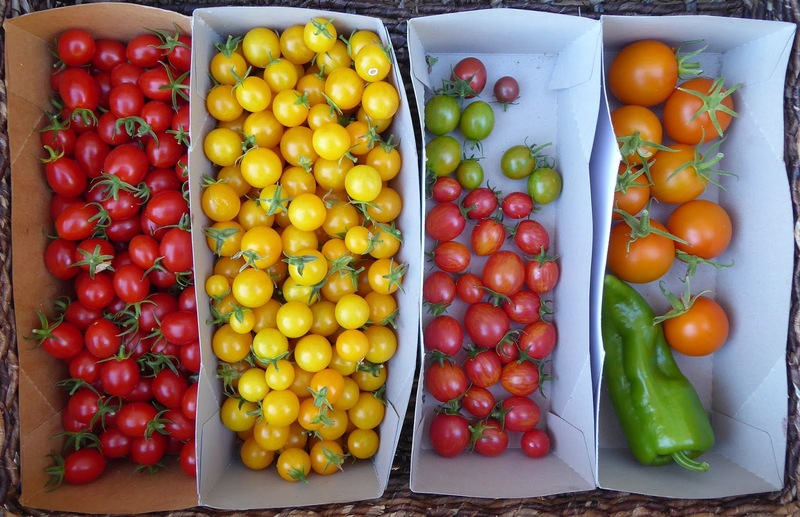 The harvests next week will be more colorful, there's still peppers and a few tomatoes left in the garden. It was a big week again for sweet peppers but the harvests will slow down quickly because most of the plants have finished producing or are nearly done. It's been a good year with a total harvest of 61 pounds so far, and that's just the sweet peppers. 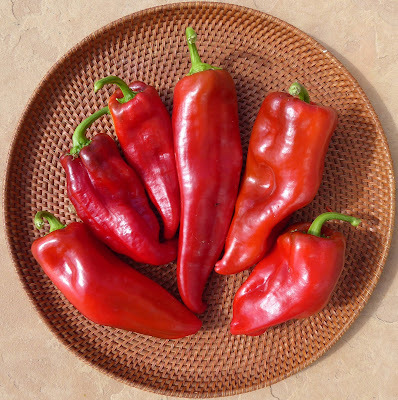 Ajvarski has become my new favorite roasting pepper. I will definitely be growing lots more of them. 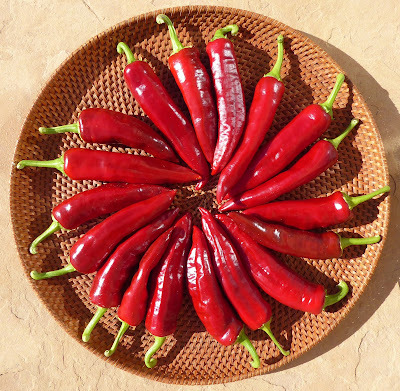 The peppers are large and thick fleshed and the flesh stays firm after roasting. There's something about the skin that makes them blacken quickly when I roast them over a charcoal fire and then the blackened skin peels off very easily. The shape of the pepper is also conducive to roasting, the flesh resists forming dents and the stems are not sunk into the top which makes it easier to blacken and peel the flesh around the stem. It's very sweet and has a faintly spicy aroma and rich flavor. The plants are a good size also, about 2 feet tall or more which is a good height for allowing the peppers room to develop without getting squished in the branches but not so large that they are space hogs. It's the closest I've found to the perfect roasting pepper. 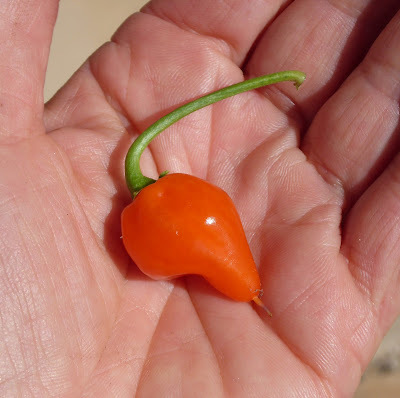 Shepherd's Ramshorn was my favorite roasting pepper at one time. 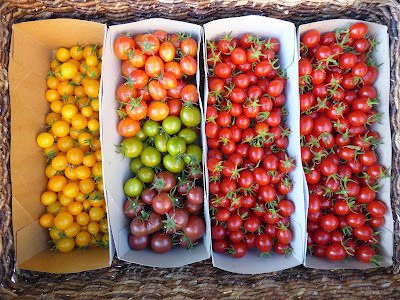 The plants are compact, prolific, and early producers. The peppers are thick fleshed and sweet. 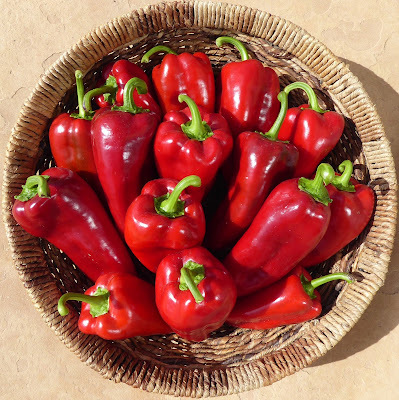 But because the plants are on the short side it means that a number of the peppers get wedged in between the branches which distorts their shape. You can also see that the stems are sunk into the tops of the peppers which makes them harder to roast. So they are a really good pepper but not quite perfect. 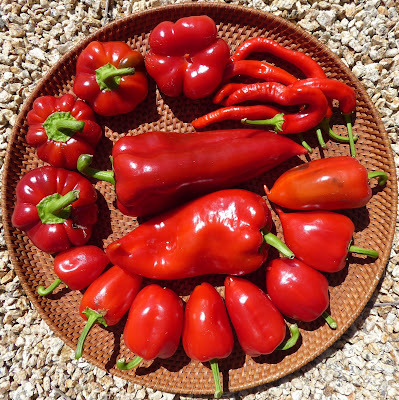 I got another nice big flush of Hungarian Magyar peppers. Those are bred to be used for making paprika so I've been dehydrating them but I haven't ground any of them yet. 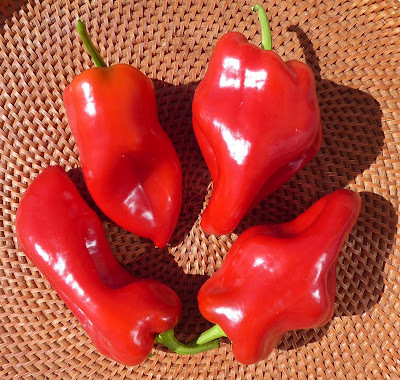 Rosso Dolce da Appendere is an Italian sweet pepper which I've been using as a roasting pepper but it's actually billed as a frying pepper. It's also supposed to be good as a dried pepper. 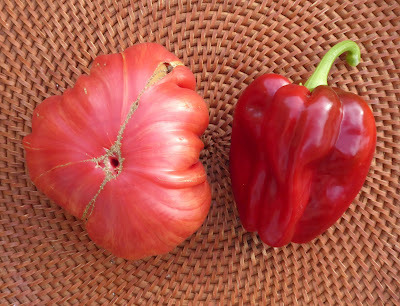 It seems rather large and thick fleshed for a frying pepper but on the other hand it doesn't quite hold up to roasting because the flesh softens a bit too much. 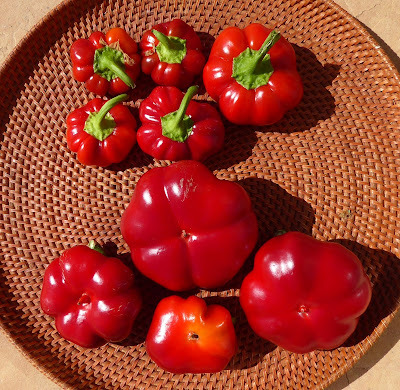 There's a fair amount of variability in the shapes and sizes of the peppers as you can see above. Actually, none of the peppers that I've grown even look like the ones on the seed packet. The most significant fault that I find with this variety is that the plants are too tall. 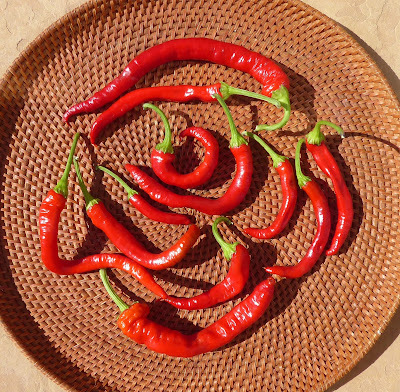 The long stems can fold over with the weight of the heavy peppers and the large plants are space hogs. The peppers are good tasting but I'm just not sure that I've figured out the best use for them. Perhaps I'll try drying some of them and see what I think of them that way. Lady Bell has been my go to bell pepper for a number of years now. It's a reliable producer of sweet ripe peppers and it is well adapted to my cool coastal climate. 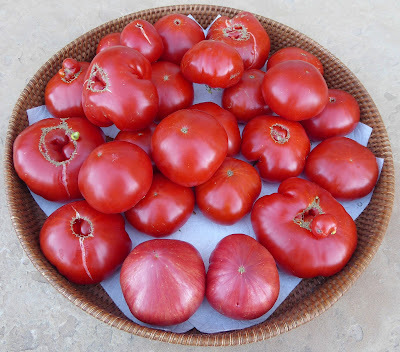 I like ripe red bells for eating fresh or cutting into rings to dehydrate or even to roast. It's a nice multi-purpose sweet pepper. That's the last of the Violet Sparkle peppers. 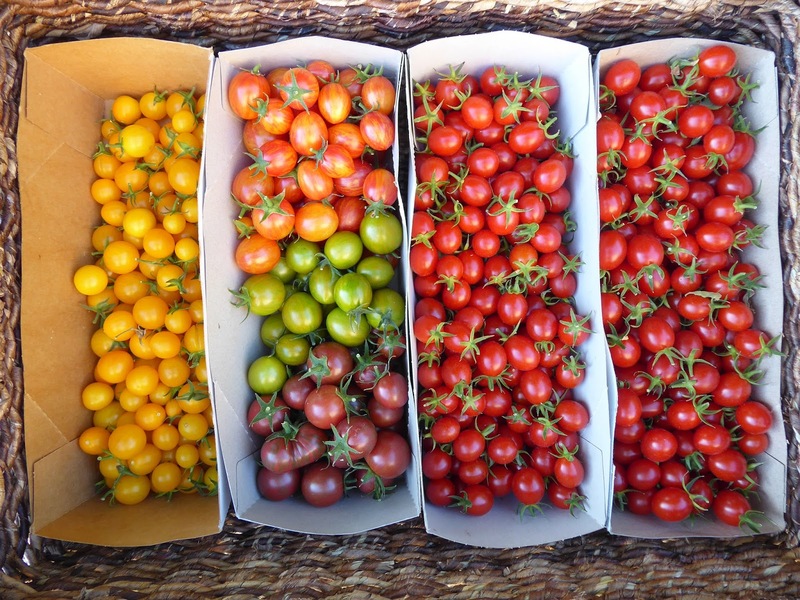 Some of them had seemingly not developed properly and had some spots that didn't ripen. 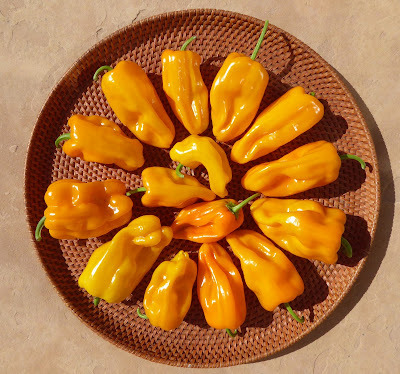 There's still a number of Gogosar and Turkish peppers ripening so there will be a trickle of those coming in for another week or so. I made another batch of stuffed peppers with some of the Gogosars but used freekeh instead of rice and changed the seasonings. Dave really liked the texture of the freekeh so I'll have to write up the recipe so that I can make it again. That little Habanada is not representative of what the majority of the peppers look like. I picked just one to taste to see if it was fully ripe. 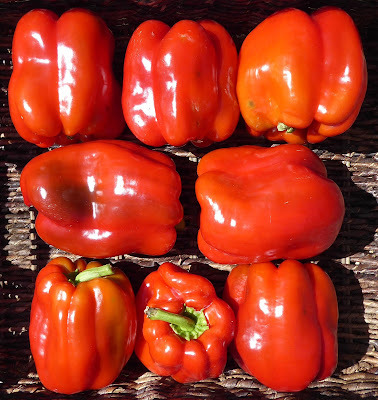 Some of the reviews of this pepper say to not pick them underripe because they have no flavor and some reviewers say they actually taste awful when they're green. And at least one reviewer didn't even like them ripe. These are billed as the first truly heat free Habanero, although there are plenty of sweet Habanero cousins around. It was indeed entirely sweet and had a very fruity flavor that lingered on the palate. I liked it. 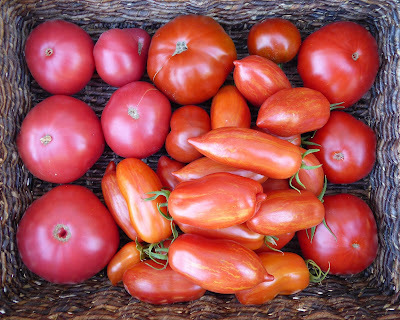 Tomato harvests aren't over yet either. 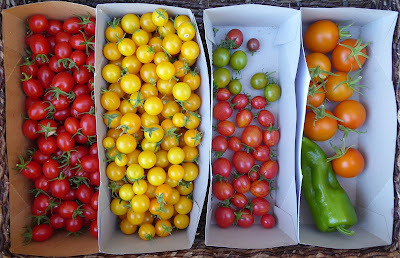 Jazz just started ripening recently, Panto just put out a big flush of ripe peppers, and Jaune Flamme has been producing steadily for weeks now. Marzano Fire is still putting out a lot of ripe peppers too. I've now got 10 1/2-cup jars of concentrated Marzano Fire tomato paste in the freezer and that doesn't include that bunch of tomatoes above. The Bee cherry tomatoes are still producing a nice moderate stream of fruits. Just enough to keep us snacking. Sweet Gold is just about finished but Piccolo Dattero is still prolific. 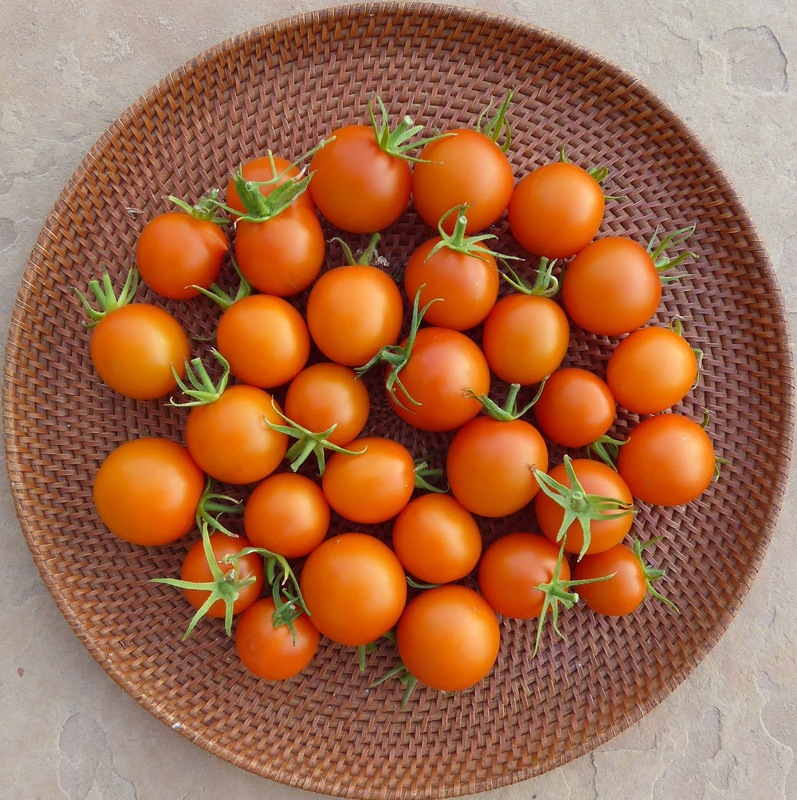 I've used a lot of the Sweet Gold and Piccolo Dattero tomatoes to make dried spiced snacking tomatoes. 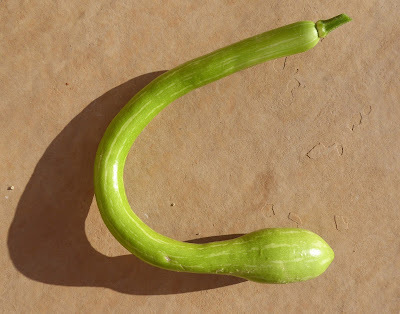 The Tromba vines are still big and healthy but they aren't producing as many squash now. 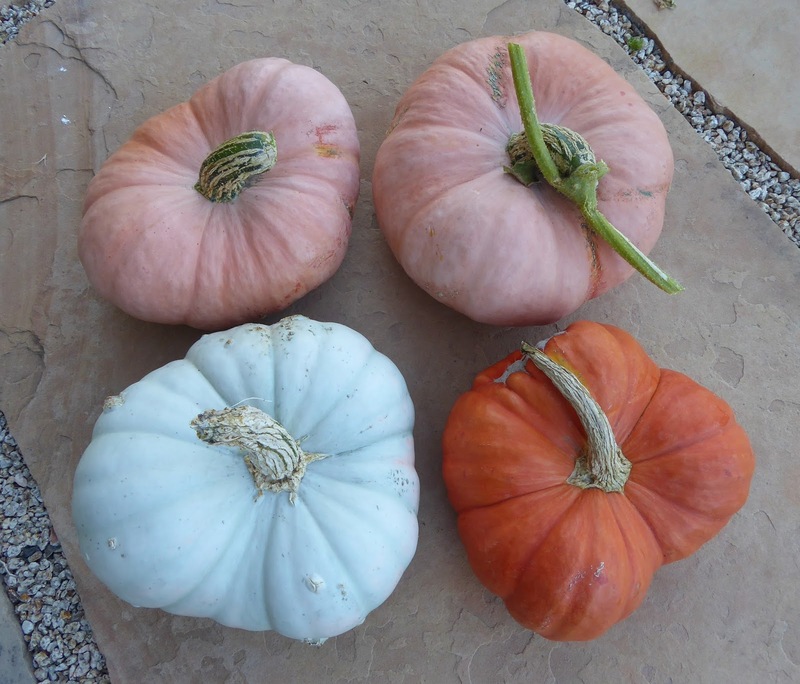 The squash develop much more slowing in the shorter days of fall. In the summer it seemed like the squash could double in size overnight and now it takes a few days. The two Terremoto squash at the bottom of the photo are cured and ready to either eat or put into storage. The two at the top just came in from the garden yesterday. The gray-green one weighed in at 10.3 pounds and the orange one at 7.6 pounds. I'll weigh the other squash after they've cured for a couple of weeks. There's 3 more smaller squash still on the vines. 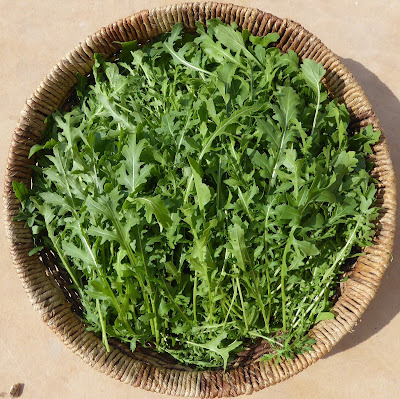 I seemed to have gotten my timing right when I sowed the fall arugula. I can harvest a nice basketful of leaves every week or 10 days and they don't seem to be inclined to bolt. There is hot weather that is descending on us for the next few days so I hope that it doesn't push the arugula to bolt. I've been keeping a light shade cover over the plants so perhaps that will help to keep them happy. Second generation fennel bulb! I neglected to pull up a couple of roots of the spring sown fennel when I cleared out the space and they resprouted and produced some nice bulbs. Next year I'll have to remember to leave the roots in place and interplant with a quick green that will be done when the resprouted fennel starts to size up. I accidentally did that this year when I sowed the cleared space with some Ethiopian mustard greens and some baby Tuscan kale. 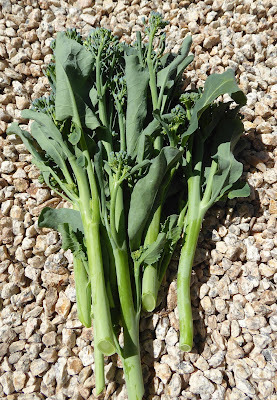 Summer sown stick cauliflower definitely produces more shoots than spring sown. I'll have to sow a few more now to see if fall sown plants can be as productive. The stick cauliflower isn't really productive for the space it occupies but it is fairly quick to produce and it is really quite delicious so I'm going to continue working with it to figure out how best to grow it. Other harvests that I didn't photograph included more Pink Plume celery, a few wonky cucumbers, some baby carrots (thinnings), Petite Marseillais, Florina, and Ethiopian Brown peppers, and Manoa lettuce. In general it's turning out to be a good year in the garden even though there were some things that I usually grow that I didn't get around to sowing or getting into the garden. The annual tally so far has exceeded 800 pounds (the total shown on the side bar doesn't include the Terremoto squash) so it seems likely that I'll get close to 1000 pounds for the year which has been the average total for the past 5 or 6 years. It's mid-October and the last varieties of tomato and sweet pepper to ripen have finally joined the party in the harvest basket. I thought for a while that the Jazz tomato plant hadn't even set any tomatoes but it was when I was in the process of whacking the vines down because of their failure to produce that I discovered some very green tomatoes lurking in the tangle of greenery so I stopped whacking and waited to see if they would amount to anything. I'm glad I waited because that first tomato turned out to be very tasty. 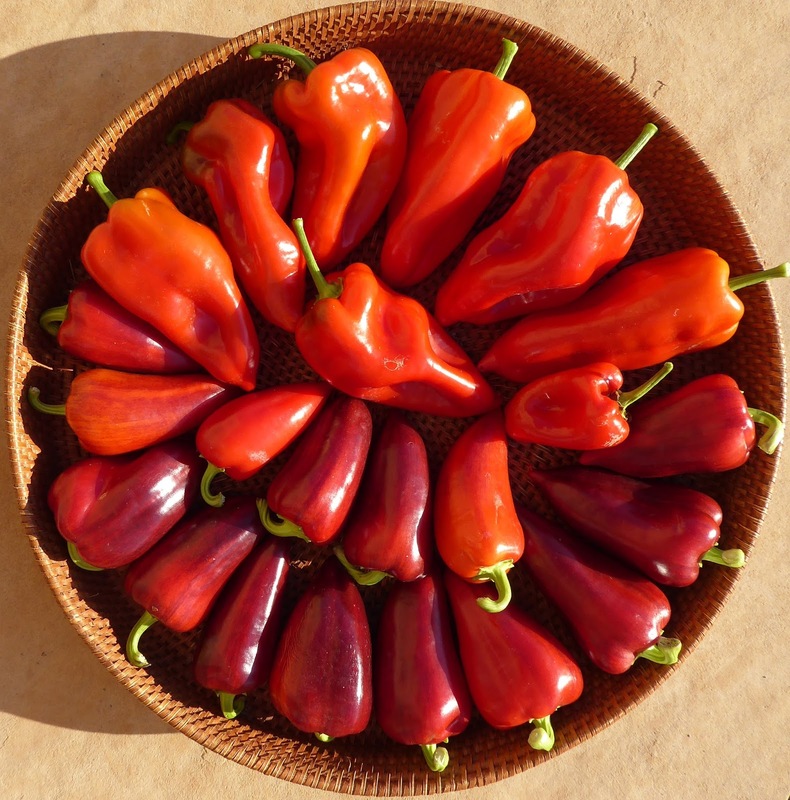 Ometepe set plenty of peppers but they really take their good old sweet time ripening. Again, it's been worth the wait. The peppers have a medium thick flesh that is very sweet. 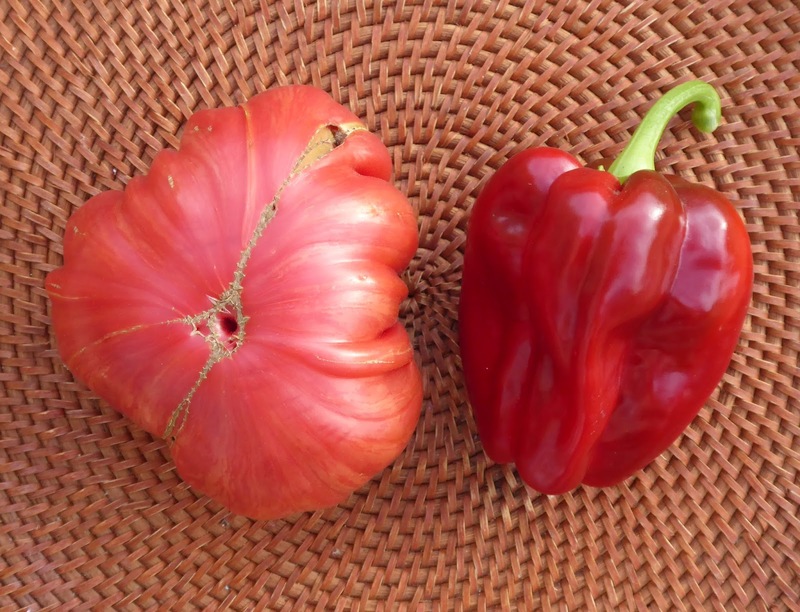 Ometepe peppers are a good size too, about as large as a small bell pepper. That's about half the ears of Hopi Greasy Head flour corn that I rescued from the rodents. 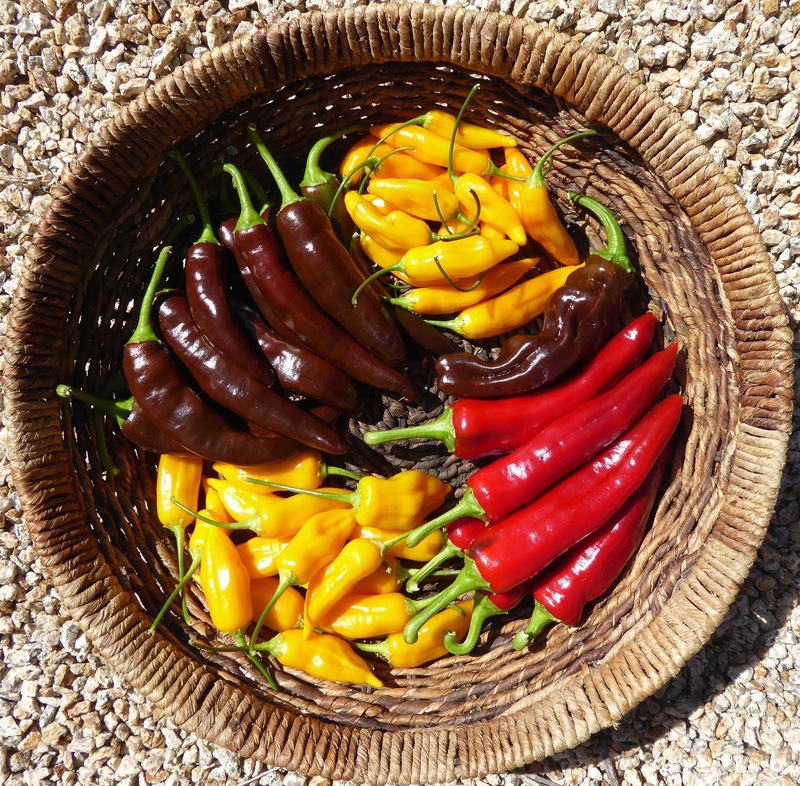 The Taos Red beans have colorful pods as well as beans. You'll get to see the shelled dry beans later. The two year old Mareko Fana plant has produce more peppers this year than last year. It will be more than enough to restock my supply of pepper flakes. 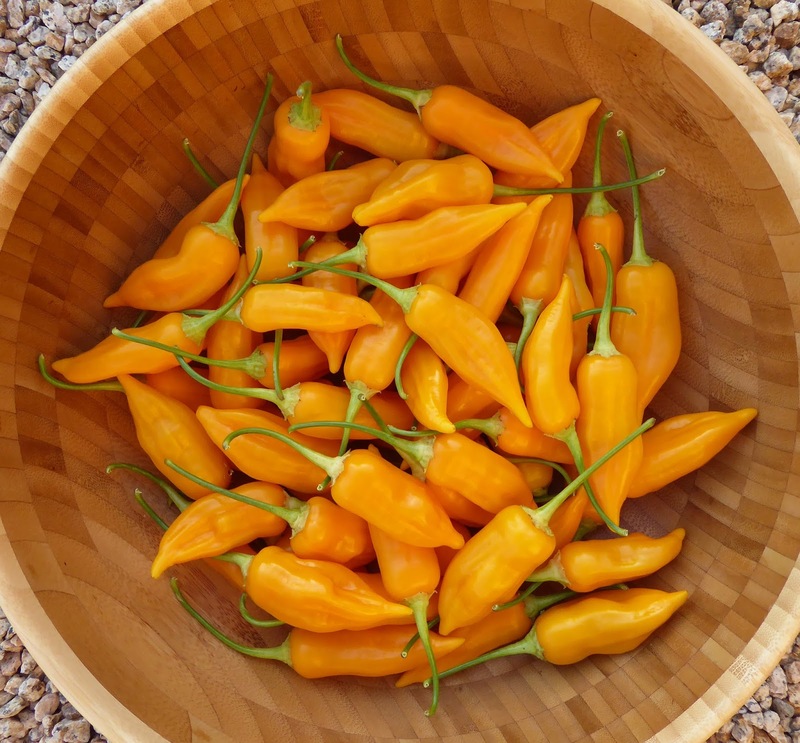 The two year old Baby Aji Amarillo plant produced enough peppers to make a batch of pepper jam, which I haven't gotten around to making yet. 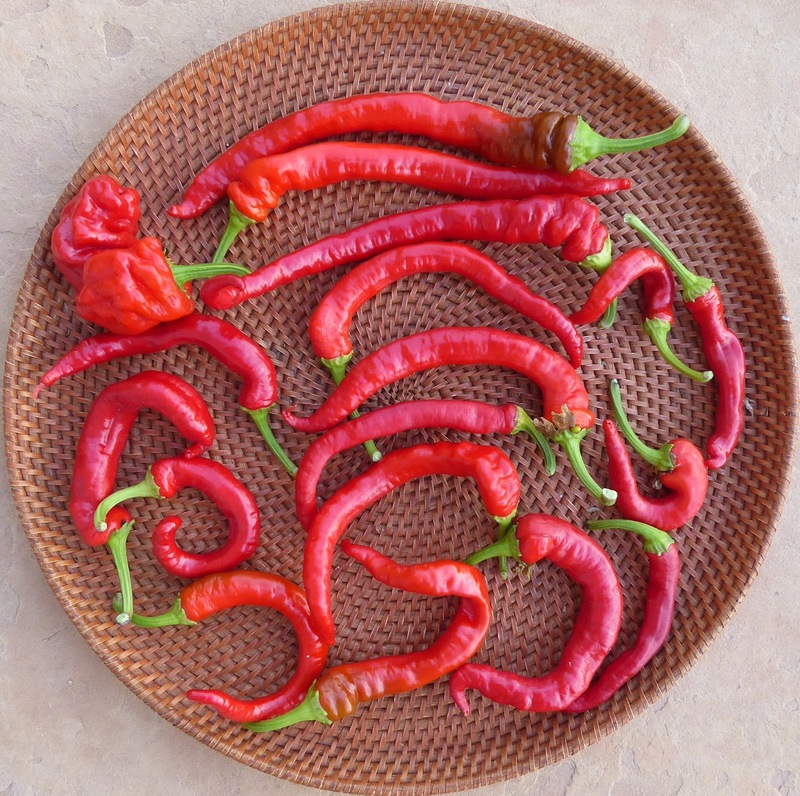 The Turkish pepper has some very nice specimens ripening now. Growing the plant in a cage made for a lot of wonky shaped peppers so I'm looking forward to growing them again next year and giving them room to spread their branches out so that the peppers are more straight. I'll have more than enough seeds to be able to grow this pepper again in years to come. For the latest harvest of sweet peppers I had no time to photograph each variety by itself so here's a group shot. Marzano Fire has totally exceeded my expectations. The plant started off quite spindly and seemed rather week and it never did get to be a large plant, but it is producing a lot of really nice tomatoes. I plan on turning these into more tomato paste. 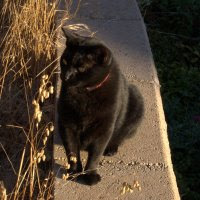 Pantano is another favorite. It's a basic red beefsteak from Italy that is well adapted to my climate. 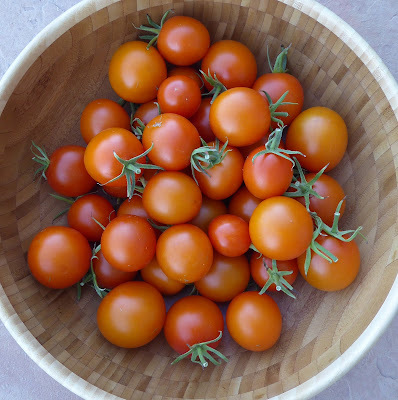 The Sweet Gold cherry tomato plant is petering out, which is a surprise because it usually produces prolifically through the fall. 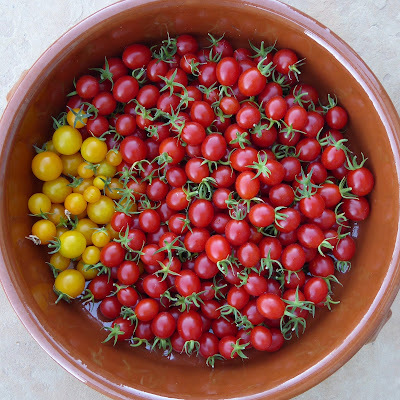 The Bee cherry tomatoes haven't been prolific but it's been nice to have a variety of colors and actually it's kinda nice to not be overwhelmed with a glut. 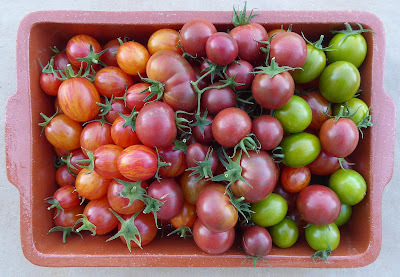 On the other hand I'm really happy to have a glut of Piccolo Dattero tomatoes since they are my favorite. I love this one so much that I'm growing 2 plants instead of the usual 1 apiece because I didn't get enough last year. 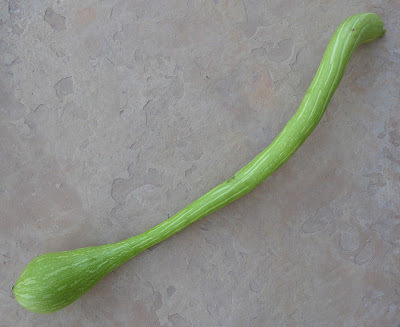 The celery is finally large enough that I can cut stalks on a regular basis. There's a few cucumbers still trickling in too but not for long, the plants are looking pretty tired. 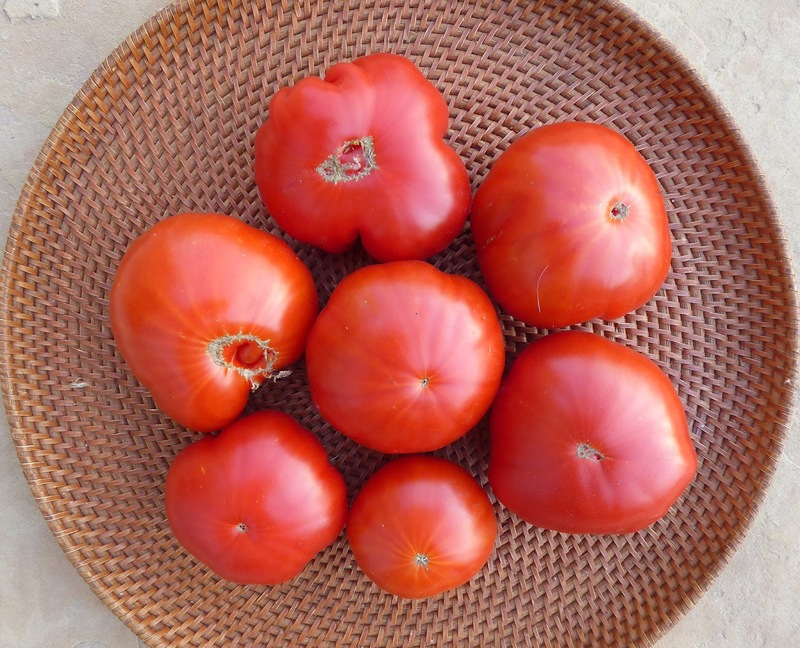 Tromba D'Albenga is a reliable producer through the fall. The plants don't produce a lot of squash but I'm getting 2 or 3 nice ones every week which is plenty. This dish was too pretty to not attempt to take a photo of it. It's based on a Turkish recipe from the book Eat Istanbul (thanks Jane for inspiring me to buy the book). The recipe called for green bell peppers which I hate so I used some Gogosar and Topepo Giallo peppers instead. Other harvests this week included a few heads of Manoa lettuce and more side shoots of Batavia broccoli. I also didn't get around to photographing the latest harvests of Ethiopian Brown, Shepherd's Ramshorn, and Lady Bell peppers. The birds have been pecking at the Shepherd's Ramshorn and Lady Bell peppers which is why I didn't photograph them. First up this week is something green again. 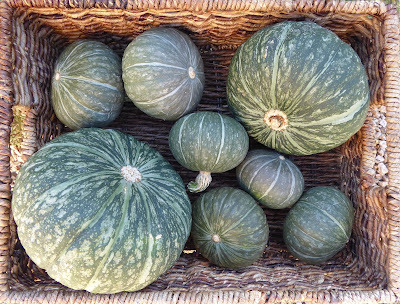 I harvested all of the Kurin Kabocha squash. I'm not sure what size I should have expected, they are supposed to be small, but the small ones are really small. I'll wait to pass judgement until I taste one of them. And there's more green in the form of lettuce and arugula. I'm relieved that both of them got through the excessive heat that bore down on the garden when these were still very small. There's no signs of bolting or bitterness. 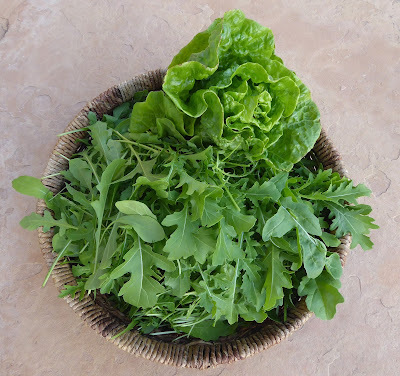 It's so nice to have fresh salad greens again. OK, back to the pepper harvests. The harvests are peaking now, some nearly finished last week and others are in full swing or getting there. I did a series of "portraits" with one round of the harvests. 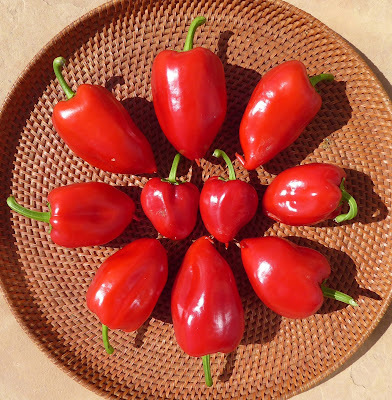 Rosso Dolce da Appendere is a long slim thick fleshed sweet roasting pepper. That's the first harvest of ripe ones shown above. This is my third year growing this variety and they're keepers. 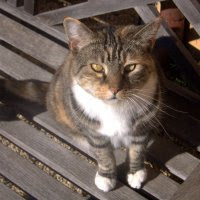 Shepherd's Ramshorn is in mid production now, as is Ajvarski. This is year 6 for Shepherd's, so it's obviously a favorite and year 1 for Ajvarski and it's promising to be a favorite. Violet Sparkle is about done, there's just a few small peppers left on the plants and Odessa Market is winding down also. 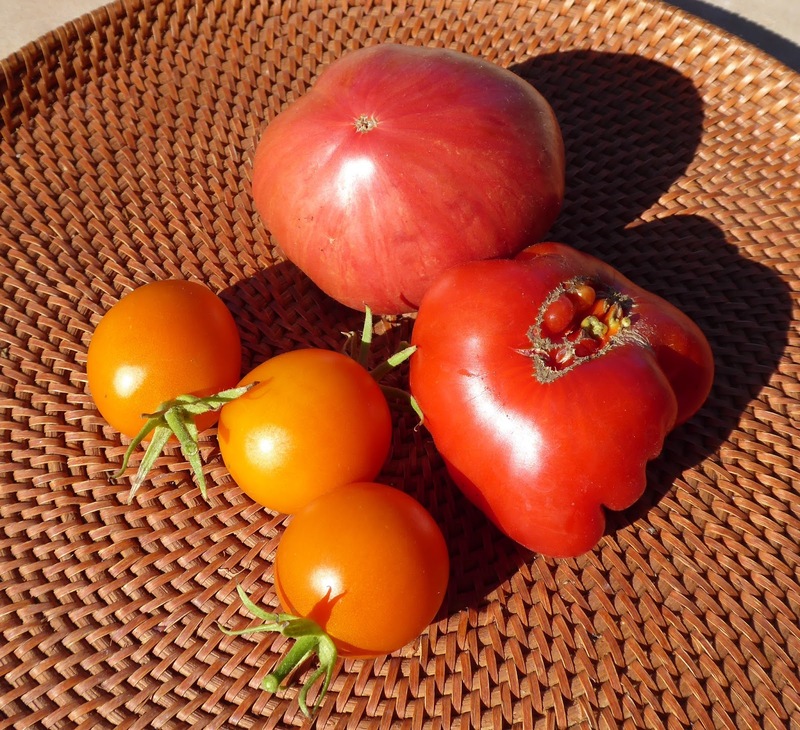 The harvests from the Gogosar plants are a mixed bag this year. The small peppers are coming from the plants that I caged for seed saving, but there's one plant that I didn't cage that is producing what I would normally expect. 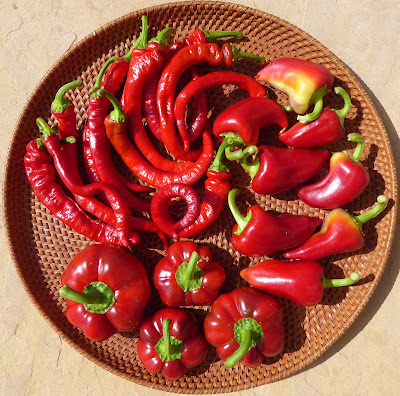 There's still a number of peppers ripening on all the plants. The Turkish pepper was also caged for seed saving so many of the peppers are on the small side, but I'm getting a few nice specimens. It seems that caging the pepper plants keeps the peppers from becoming large, I noticed the same thing with the caged Florina plants, but other than size the peppers are good quality and I'm getting plenty of seeds. 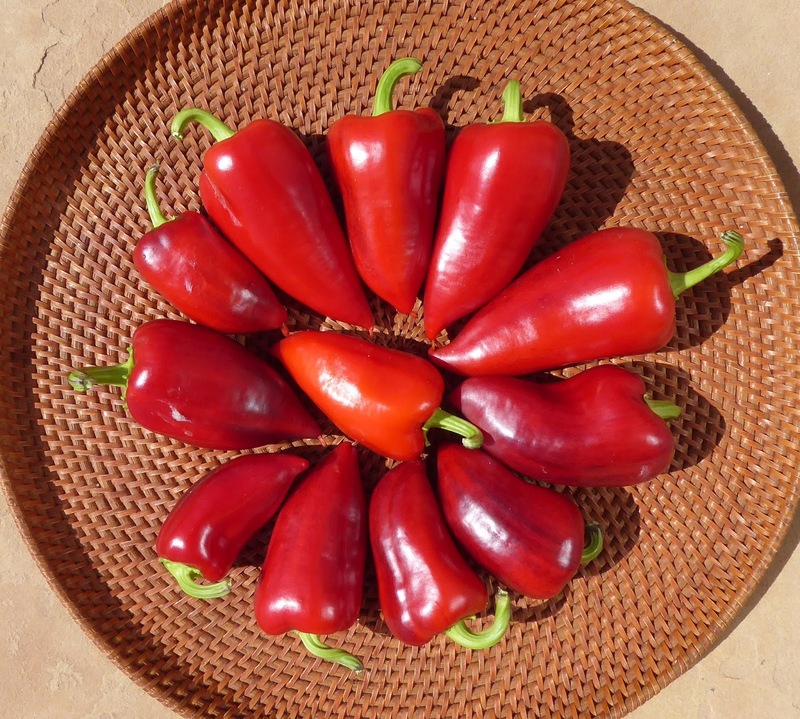 The Hungarian Magyar peppers are in mid production now. 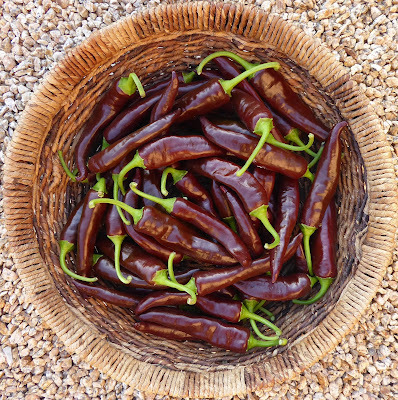 I've dried one batch of these but haven't ground any into paprika yet, I'll save that task for when the entire harvest is done and dried. Topepo Giallo is about way through the harvest now. I've been searching for a good thick fleshed sweet yellow pepper and have not been impressed with the ones that I've tried so far but this might be the one. I'll try it again next year to confirm. 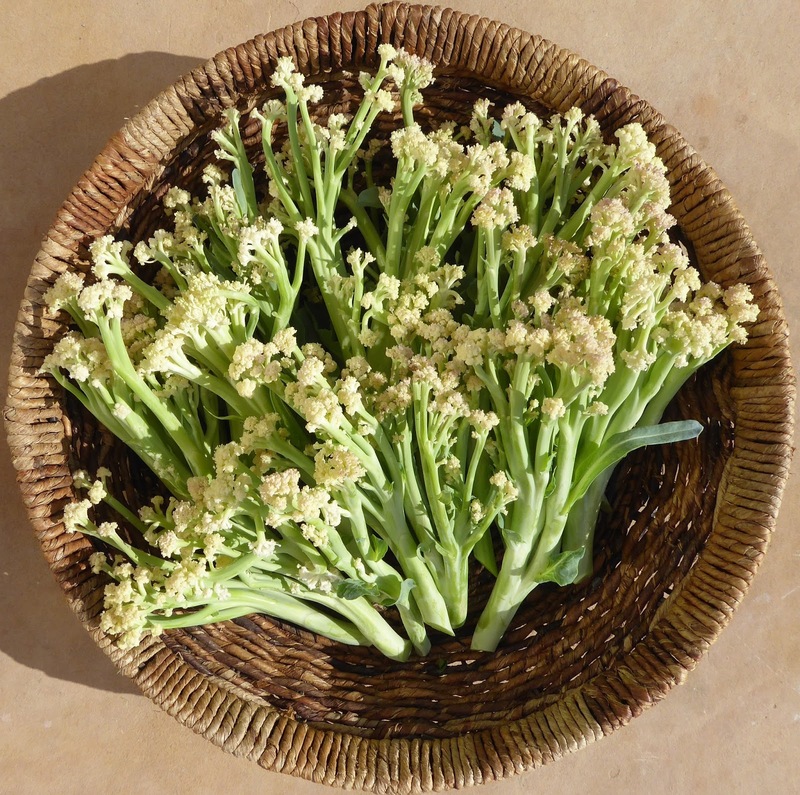 Petite Marseillais is thin fleshed and sweet. This is a great frying pepper and also dehydrates well. This is year 2 for in my garden and it was one of the few varieties of peppers that I got to enjoy last year before powdery mildew and rodents set in. I'm enjoying it again this year and will grow it again next year. I wan't very good at getting the camera out last week so you'll just have to believe me when I say that I harvested a bunch of cherry tomatoes, the last Romanesco zucchini, more Tromba D'Albenga squash, the first stalks of celery, more chard, and more broccoli. I had a busy week last week and it was all I could do to get things harvested and dealt with. This is not your usual jerky. 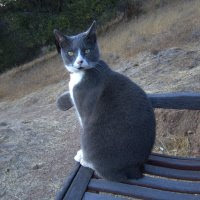 First, there's no beef involved, nor turkey, nor any other animal, with one minor exception. Nor is there any black pepper, as would be the case with the usual Pepper Jerky, aka a strip of dried seasoned beef (typically beef) with a liberal coating of cracked Piper nigrum. 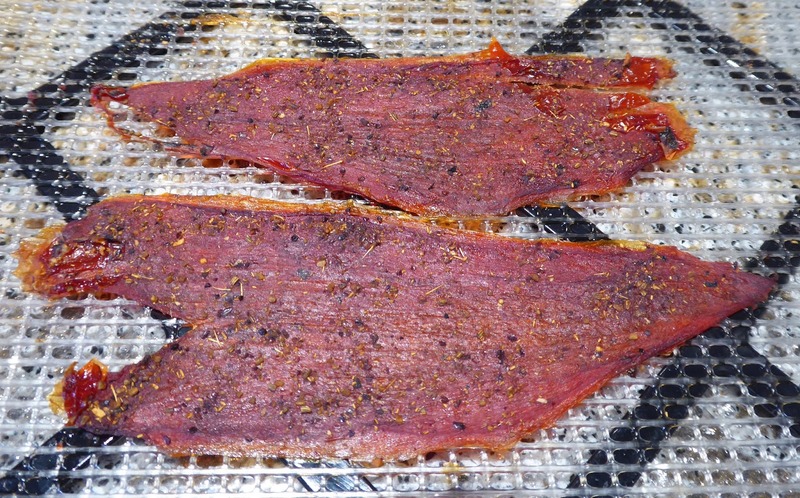 No, this is Sweet Pepper Jerky because I couldn't think of a better name for it. It's a lot easier to call it Sweet Pepper Jerky than it is to call it Dried Seasoned Roasted Sweet Peppers which is what it is. This all started 3 years ago when I had a wonderful glut of sweet peppers, 70 pounds of good sweet roasting peppers, and I was running out of space to store the preserved versions. Coincidentally I had just purchased an Excalibur dehydrator and I was, I think, at least I should have been, trying to find ways to justify the investment. So with no more room in the freezer for another bag of frozen roasted peppers and no more room in the second fridge for another jar of Peppers Sott'Olio I figured I had nothing to lose by seeing what would happen if I dehydrated the latest and nearly last batch of fire roasted sweet peppers. 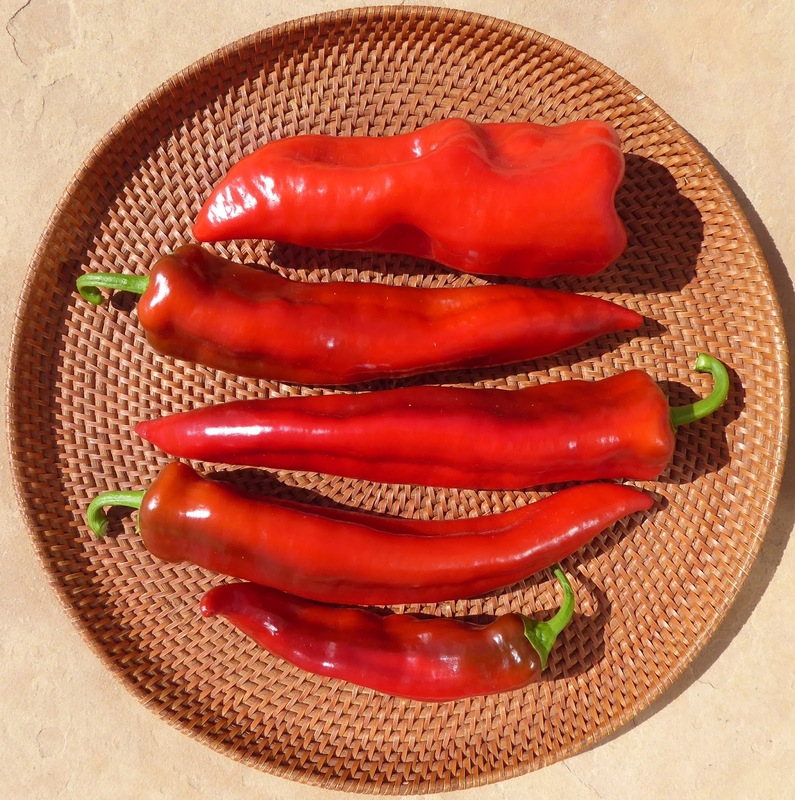 These were the results of my first experiment with dehydrating roasted peppers. My first impression was "fruit leather" but it's not fruity even though it's very sweet and "pepper leather" sounded downright yucky so "dried roasted sweet peppers" is how I labelled them. Unfortunately the experiments stopped there because it was November and the pepper plants were about done for the season. Dried roasted sweet peppers are really good just plain. They're good to snack on and good to cook with too. 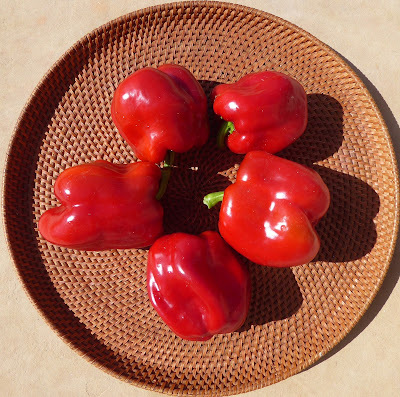 I chop them up and use them in dishes when I want to have that smoky sweet roasted pepper flavor in a dish. They can't be ground up into a sweet smoky powder, they stay sticky and leathery even when they are completely dehydrated. I found that the best way to store them is in a tightly sealed jar, no need to refrigerate. I tried sealing some of them in a vacuum sealed bag but made the mistake of stacking them together and then when I removed them from the bag they had stuck together so tightly that they couldn't be peeled apart. So, come 2016 I didn't really get much of a chance to experiment more because the pepper gods made up for the previous glut by delivering a really dismal disease and critter impacted harvest. There were only 20 pounds of roasting peppers that year, barely enough for simply enjoying in the moment much less stocking the freezer, and the fridge, and the pantry. So, this year it finally dawned on me when I dried the first round of roasted peppers (I'm a little slow sometimes) that the texture of the dried peppers is a bit like jerky. Ah ha! Lightbulb moment! So why not go with that texture and add some seasonings to give them more of a jerky flavor. Fortunately the harvests are looking up compared to last year so I've got plenty of peppers to experiment with. I'll say now that one thing I like about this way of preserving is that you don't have to commit to a large amount. For my first experiment I took the seasoning mixture that I use to make seasoned dried cherry tomatoes (fennel seed, dried onion, smoked pepper, salt - all ground together to a fine powder) and simply sprinkled it on some of the roasted peppers and dehydrated them at 125ºF until leathery. I was immediately smitten. But, still it was not quite what I was looking for. For round two I tried to different two different mixes with more of an Asian flavor profile. Mix #1 was a tablespoon of Tamari soy sauce and 1/4 teaspoon 5-spice powder. Mix two was, 1 fresh Makrut lime leaf minced, 1 small clove fresh garlic, dried coriander seeds (forgot how much, 1/4 teaspoon?) all smashed together in a mortar and then mixed with 1 tablespoon Vietnamese fish sauce. Toss the roasted pepper pieces in the seasoning and dehydrate at 125ºF until leathery, just a few hours. Each batch of seasoning was enough for about 2 large or 3 to 4 smaller peppers torn into strips. Now these were more like it! If you like the flavor of a Thai style curry seasoning (without chile pepper heat) then mix #2 is for you. If you're more of a Teriyaki fan than mix #1 comes close. The one thing I would change in mix #1 is to add some ginger. Mix #3 which is in the dehydrator now has the ginger in it as well as some dried onion powder (home grown and dried) but my first sample tells me that I overdid the ginger. That was 1 tablespoon Lite Tamari (50% less salt just because I don't need it), 1/4 teaspoon dried onion powder, 1/4 teaspoon dried ginger, and 1/8 teaspoon 5-spice powder. Next round I'll try switching the proportions of ginger and 5-spice. If I had had fresh ginger on hand I would have tried that instead of the dried so perhaps I'll pick some up if I get to the store any time soon. I think that a super easy way to make Sweet Pepper Jerky would be to start with sweet roasted peppers from a jar. Just drain, cut into strips, and toss with some of your favorite marinade or sprinkle with a BBQ rub. Then dehydrate them at 125ºF until leathery. 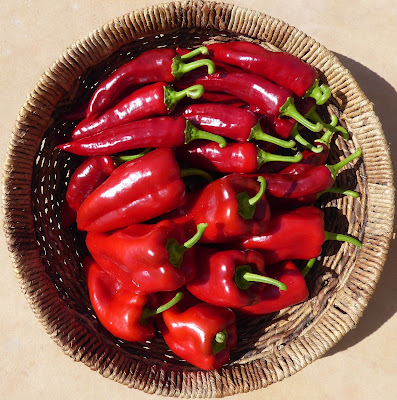 I think you would want to avoid a seasoning that has a lot of sugar in it because the peppers are plenty sweet to begin with and dehydrating them just concentrates the sweetness. Now, Mix #4, what will that be? Oh, one more thing. 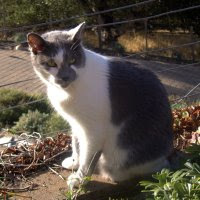 Tomorrow, October 5, from 10 a.m. to 1 p.m. Pacific Daylight time, I'll be joining a group on KKUP Radio 91.5 FM Cupertino, CA on the Old Time Farm and Garden Show. 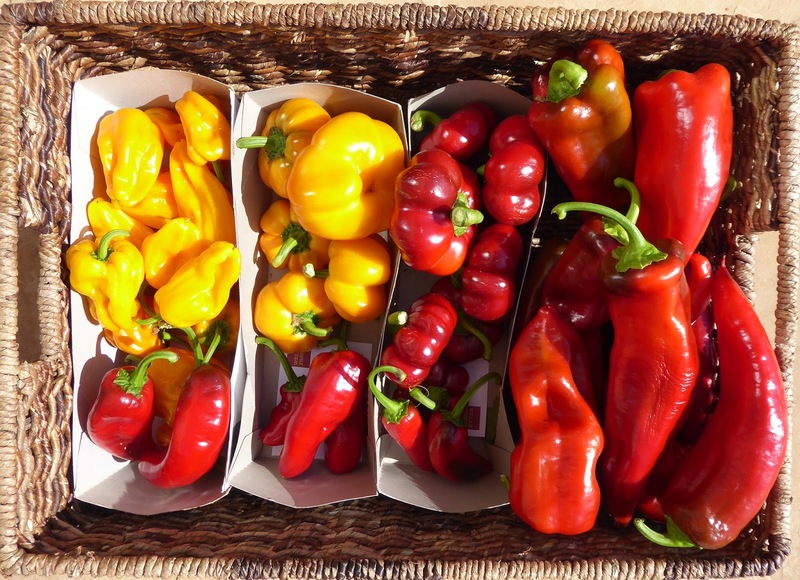 We'll be spending some of the time talking about peppers of all sorts and on other garden topics as well. You can find a link on KKUP's website for live streaming if you want to listen in. Whoops! Got my dates screwy, the show is on October 26 and I won't be there... Sorry if you tried to tune in on the 5th and didn't hear what you were expecting. 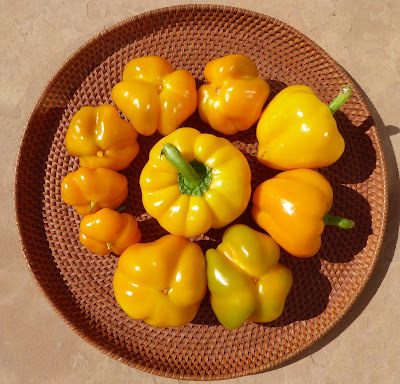 I grow a lot of sweet peppers and I especially like thick fleshed ones that are good for roasting. Lady Bell has been a reliable producer for me since I first tried it back in 2012. It's great roasted but also good in any other way that you might eat a sweet bell. 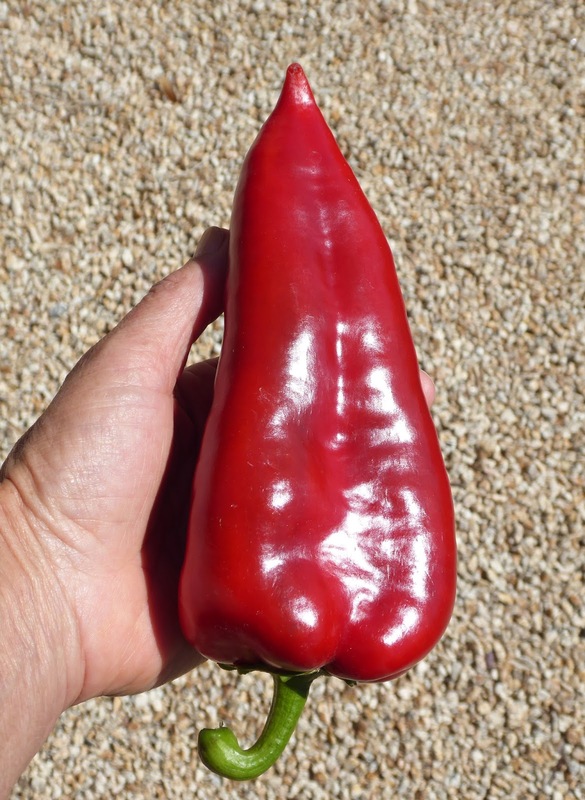 The long skinny Turkish pepper isn't a roaster but it is good sliced up and added to salads. Odessa Market is a small pepper but has thick enough flesh to make it a good roasting pepper. Gogosar isn't a great roasting pepper only because of its shape, but it is delicious raw and is the perfect pepper for stuffing and baking. Ajvarski is a new one in the garden this year and I'm really pleased with it so far. Those are the first 2 ripe peppers and there's one of them shown below in my hand to get some perspective on the size. My seasoning peppers are starting to ripen also. I have 3 Baby Aji Amarillo plants, 2 that I started this year and one that came back from last year. Last year the peppers were sweet with barely a hint of heat. The peppers from the new plants have some heat but the ones from the 2016 plant are sweet again. The Mareko Fana peppers are coming from a plant that came back from 2016 also. It's actually producing more peppers this year than last year. The other brown pepper is the first Ethiopian Brown to ripen. I'm not yet sure how similar it is to the Mareko Fana (also an Ethiopian pepper), I'll compare the two after I've dried them. 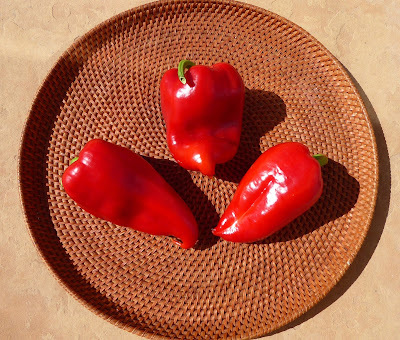 Mareko Fana is my pepper of choice for making pepper flakes. Another new pepper this year is the Hungarian Magyar, it's a sweet paprika type so it's destined for the dehydrator also. This looks to be the last harvest of large tomatoes for a bit. There's still some left on the plants but most of them are green. 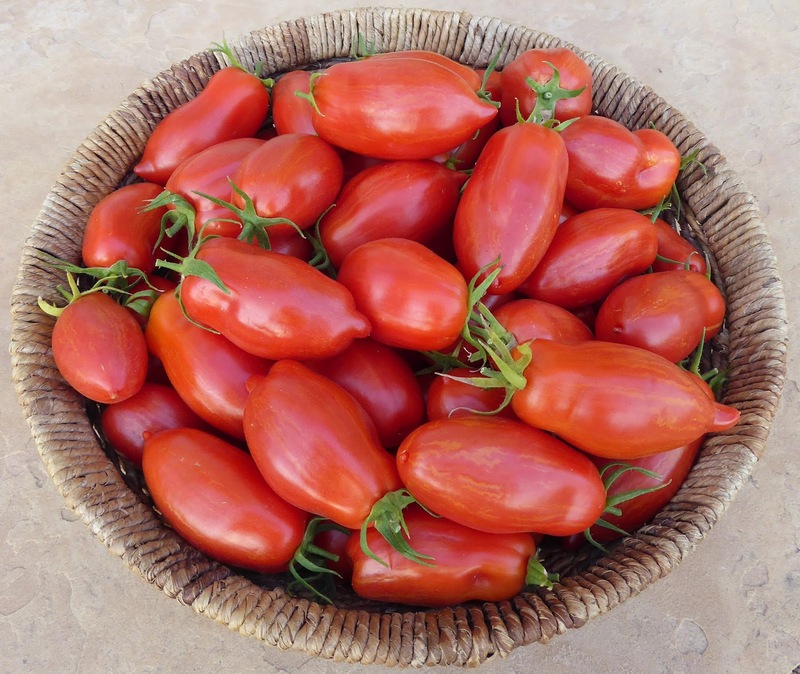 The Marzano Fire tomatoes are ripening at a steady pace though. I'm surprised at how prolific that plant is since it's a rather spindly thing and I really didn't expect much from it. 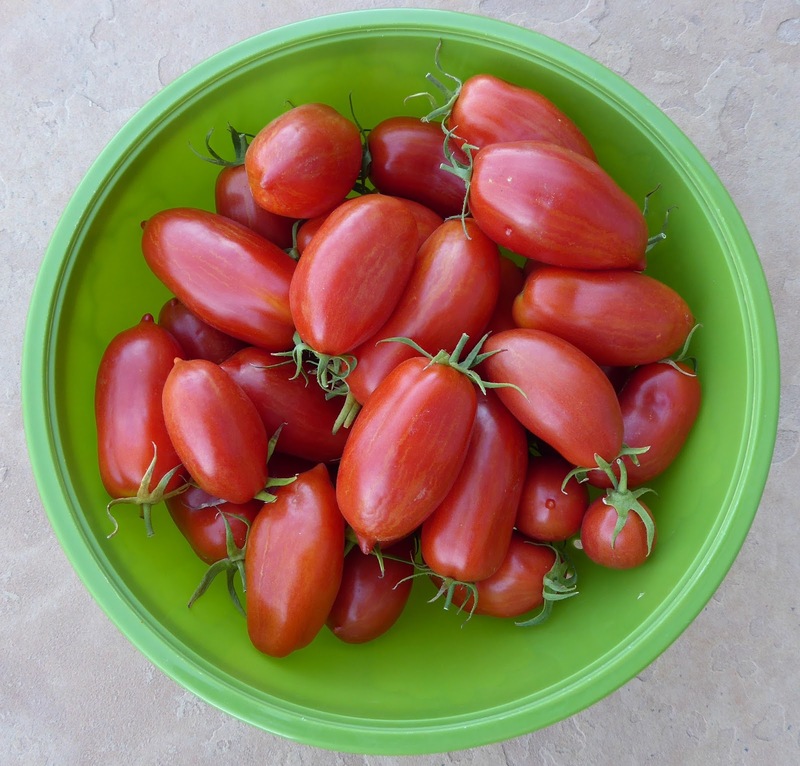 I had 5 pounds of them which was enough to make a batch of tomato paste. 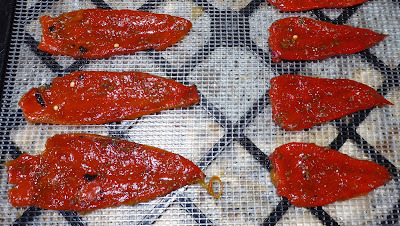 I've been experimenting a bit more with dehydrating roasted peppers. Back in 2015 I was facing quite a glut of peppers and was running out of space to store the roasted peppers that I was preserving either by freezing or preserving "Sott'Olio" (20 jars in the fridge then! 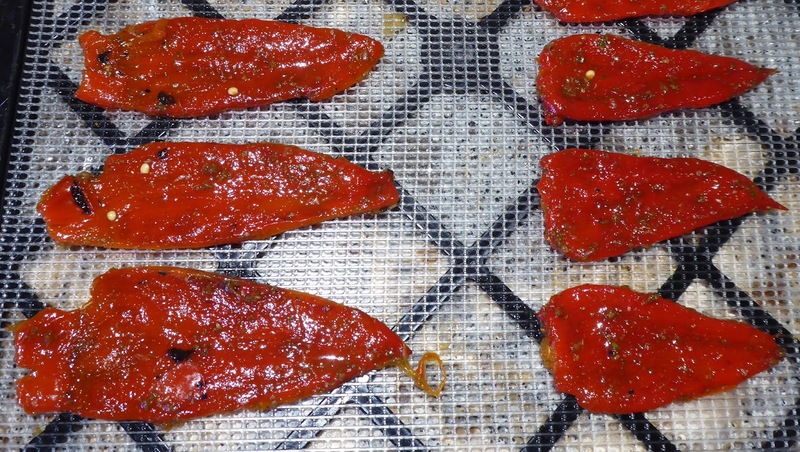 ), so I experimented for the first time with dehydrating the roasted peppers. Ooh la la, were they wonderful, sweet and chewy concentrated pepper goodness. I'm dehydrating more of them this year but I thought I would go with the jerky like quality that they have and try adding some seasonings. Oh wow, big yum. I think I'll save the details of my seasonings for a separate post. 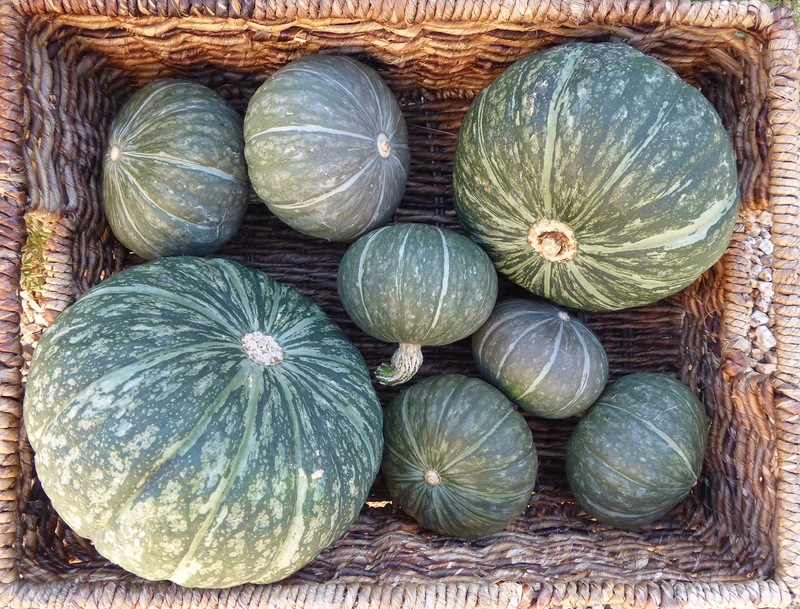 Another notable harvest for the week was a Tromba D'Albenga squash. The vines are growing like crazy again and there's more squash about ready to harvest so it looks like I'll get to enjoy them for at least a few more weeks. 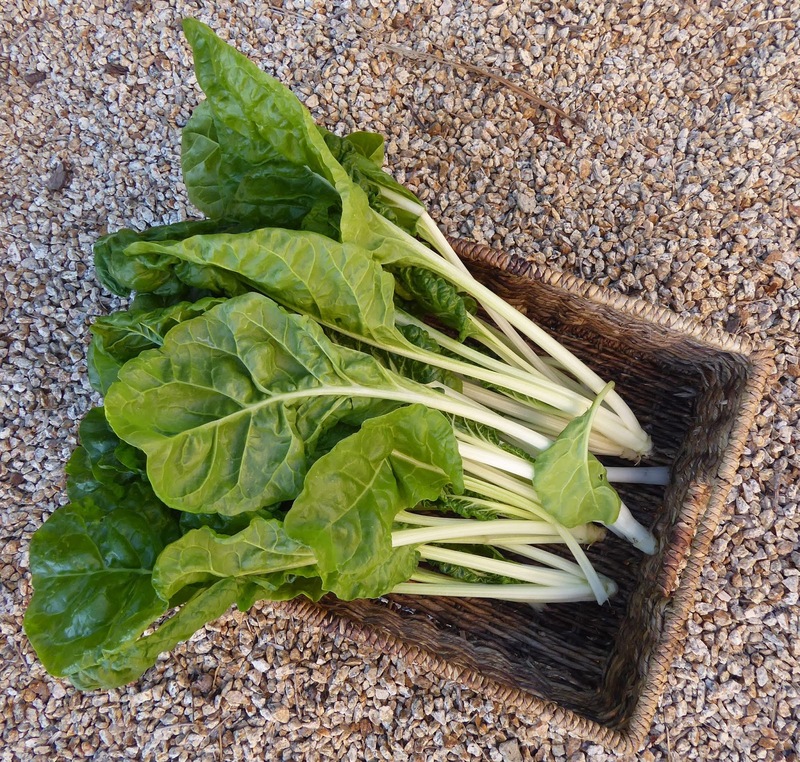 New in the harvest basket was some Special Baby Leaf Chard, um, not quite babies anymore but still very good. I used it in a Tunisian dish of Chickpeas and Chard in a tomato sauce. I used some Pico Pardal chickpeas that I grew in 2015 and even though they were 2 years old they cooked up in no time and had a perfect texture and very fine flavor. I think I'll have to devote some garden space to those again in 2018. There's still no shortage of Batavia broccoli but that harvest of Broccolini shown below will be the last one until the new plants start to produce. 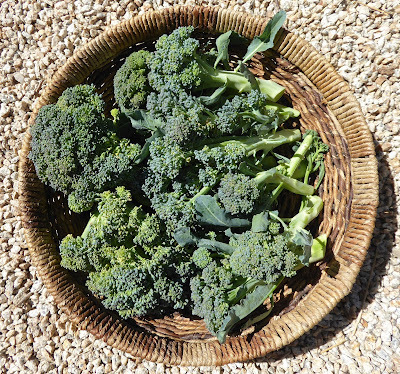 That was the harvest from 4 plants so I deemed it time that they made way for something new, entirely new in my garden Petite Snap-Greens.